The purpose of the Legacy Walk is to Support Physical Therapy Research here in Illinois! While the Legacy Walk was initially formed to help IPTA meet its pledge to raise $22,500 to help fund the Foundation for Physical Therapy’s Center for Excellence in Health Services Research, we have met our goal through the help from our many generous benefactors. Now you can STEP UP and PAVE the WAY for RESEARCH in ILLINOIS. 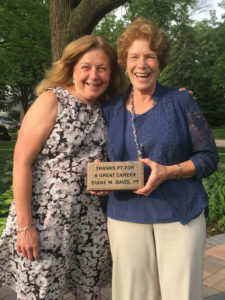 All proceeds from your purchase of a paver for the Legacy Walk will help fund our $1000 Research Grants, https://iptfgives.org/research/iptf-1000-research-grant-application/. Besides helping to raise funds, the Legacy Walk is a timeless tribute to the importance of physical therapy and to the individuals committed to preserving its future. Help IPTF to support research and to create your own legacy in Physical Therapy! All paver purchases are 100% TAX DEDUCTIBLE. We challenge you to take the first step today! All together we are supporting Research in Illinois! 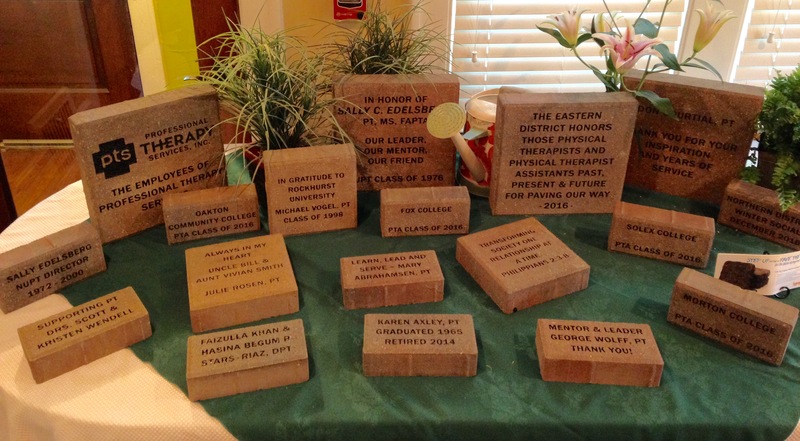 Honoring our newest Legacy Pavers. So many donors that we need 2 photos. Acknowledge a professor who played a special role in your physical therapy education. Show your appreciation for received guidance and support. Thank members for their personal contributions to the profession of physical therapy. Acknowledge years of service in leadership roles. Mark the day you received your license or received special acknowledgement for your work in PT. Record milestones or look back at your career years at retirement. 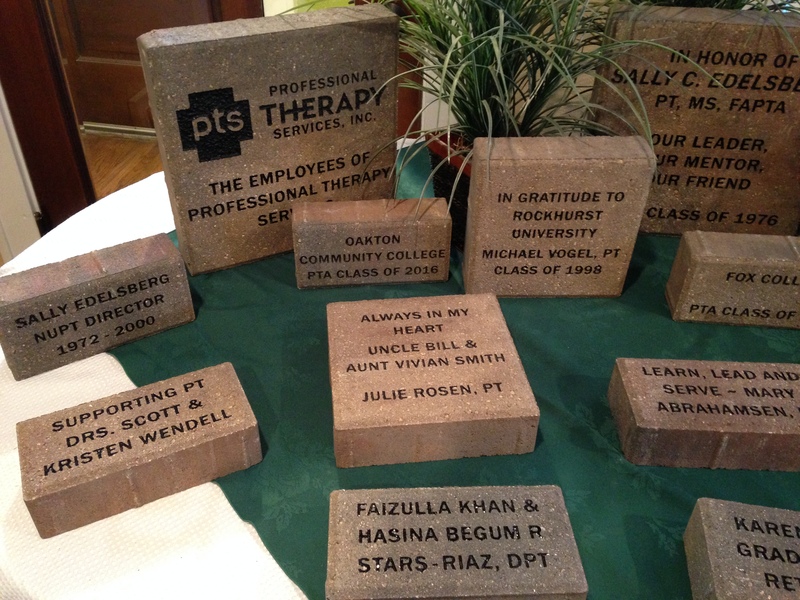 Commemorate your graduating class or declare your personal dedication to physical therapy. Recognize the achievement of opening your private practice. Memorialize a professional peer with a lasting token of your remembrance. Note past experiences, missions, teams, special projects or community events. Maximum 3 lines, 15 characters per line. 8" x 8" brick Most Popular! Maximum 6 lines, 15 characters per line. Maximum 9 lines, 20 characters per line. 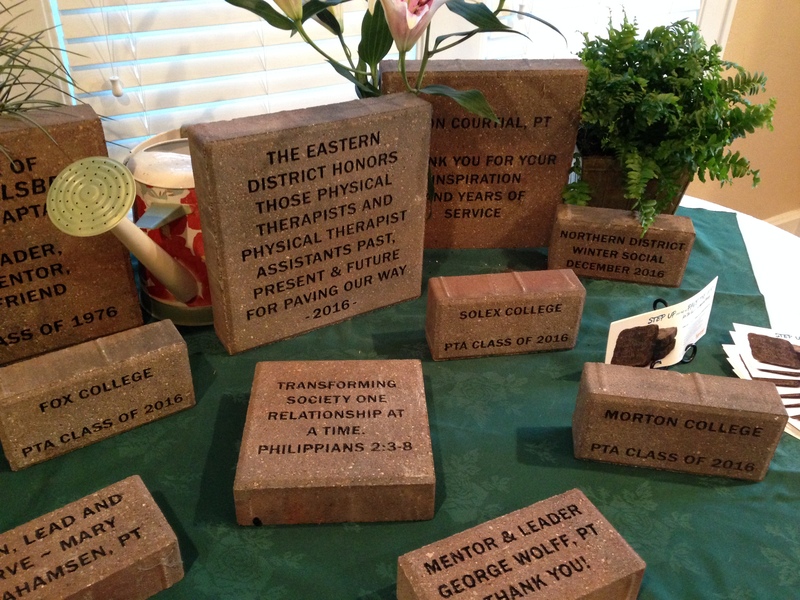 Once payment for your paver has been completed, please call Linda Griffith at 630-904-0101 or send an email to lgriffith@ipta.org with your engraving instructions. For any questions regarding brick paver purchase, don’t hesitate to contact us! What is the Legacy Walk? 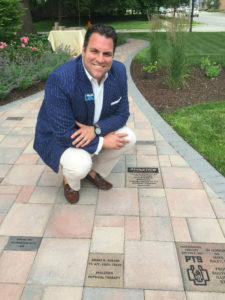 The Legacy Walk is a pathway of paver bricks outside of the IPTA chapter office in Naperville, Ill. 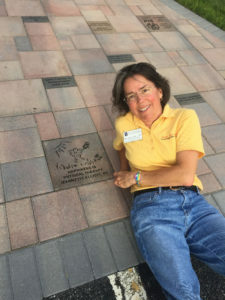 The Legacy Walk is the PT version of the “Hollywood Walk of Fame.” Its existence is a timeless tribute to the importance of physical therapy and to the individuals committed to preserving its future. Yes! Your tax-deductible purchase will help further advancements in physical therapy, as 100% of proceeds fund PT research. Pavers are available in three sizes: 4″ x 8″, 8″ x 8″, and 12″ x 12″. Prices are $100, $250 and $400, respectively. Can a group purchase a paver? Of course! Life is busy – schedule time with your peers to decide on your paver intention and message. Set a deadline so that your group has their order ready to place within one of the two installment periods. I don't live nearby. How can I see the paver when it's installed? IPTF staff will contact you when your paver has been created. 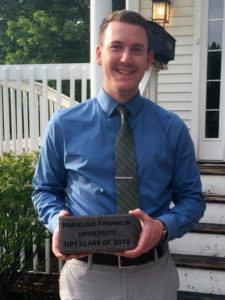 We will be happy to email photos of your completed engraving, and also after the paver has been installed.